If your occupation is connected with appointments and meetings, this template is for you. There are so many different meetings with so many different people and you need to find the right time and place for all of them. Sometimes it is tough to take into account all the details that are necessary, especially when it comes to changing and cancelling bookings. 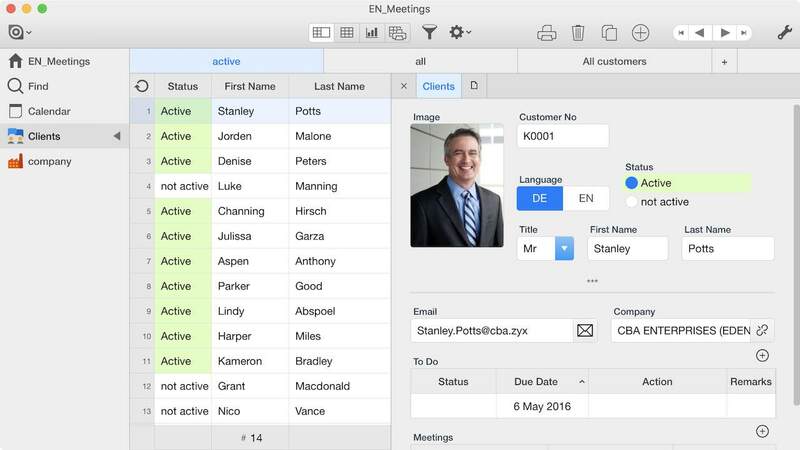 Ninox software will help you with scheduling your appointments and meetings and fixing the time and date for them. Moreover, all of them will appear in the calendar. You will be able to create meeting report and to define to-do lists to follow up. Having a system allows you to keep track of past interactions with your clients and potential customers. You can use this app to structure your approach to customer relationship management and sales process. This template can be used by office managers and personal assistants for organizing and planning their agenda, but can also be used by lawyers or doctors to manage their appointments.